Although it's a subject I have often written about, this particular post about fighting child malnutrition is inspired by a recent email from Col. Pavan Nair, an Army officer turned social activist, and a patriotic Indian with a deep sense of service to those in the greatest need in his country and its neighborhood. 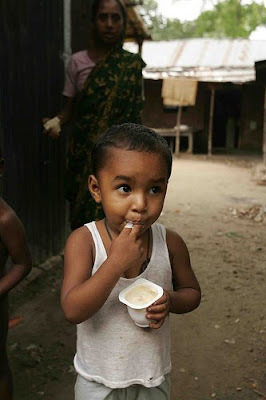 In 2009, the Indian government banned the import of Plumpy'Nut nutrient bar by UNICEF to treat moderate to severe acute malnutrition among Indian children. Defending the government action, Mr. Shreeranjan, the joint secretary of the Ministry of Women and Child Development, told the Reuters that "Nothing should come behind our back. Nothing should be done in the name of emergency when we have not declared an emergency." Clearly, Mr. Sheeranjan does not see the food emergency that is causing almost half of India's children to be malnourished. 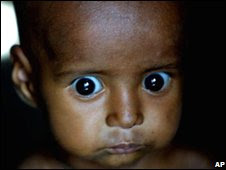 According to UNICEF's State of the World's Children's report carried by the BBC, India has the worst indicators of child malnutrition in South Asia: 48% of under fives in India are stunted, compared to 43% in Bangladesh and 37% in Pakistan. Malnutrition is the leading cause of death in children in developing countries, including India and Pakistan. According to World Health Organization about 60% of all deaths, occurring among children aged less than five years in developing countries, could be attributed to malnutrition. Those who survive the trauma of early childhood malnutrition suffer various degrees of brain damage and continue to lack sufficient cognitive and motor skills later in life. In the face of such shocking data, what is particularly disturbing is the lack of focus in pursuing solutions to this problem that affects tens of millions of children in the developing world, especially in sub-Saharan Africa and South Asia. If the governments, such as India, are concerned about dependence on foreign food imports, they need to have policies and plans in place to encourage development of local alternatives to what are called ready to use therapeutic food (RUTF) bars such as Plumpy'Nut made from fortified peanut paste. Community-based therapeutic care is being pushed in Pakistan by an Agha Khan University project. It is an attempt to maximize broad impact through improved coverage, access, and cost-effectiveness of treatment for malnutrition. Such community-based nutrition packages can provide effective care to the majority of acutely malnourished children as outpatients, using techniques of community mobilization to engage the affected population and maximize coverage and compliance. Children with SAM without medical complications are treated in an outpatient therapeutic program with ready-to-use therapeutic food and routine medications. It proposes the use of Ready-to-use Therapeutic Food (RUTF) and Fortified Supplementary food for the treatment of moderate and severe malnutrition. The advantage of these commodities is that they are ready-to-use paste which does not need to be mixed with water, thereby avoiding the risk of bacterial proliferation in case of accidental contamination. While the advantages of the RUTF solutions such as Plumpy'Nut and Cipla's generic equivalent Nutrinut are proven, the cost of such treatment needs to be made a lot more affordable than it is. A standard Plumpy'nut treatment goes for four weeks (twice a day) at a cost of 12 Euros in Africa. India's Cipla also makes a generic version of Plumpy'Nut. It's being used in Nepal for Nepali Rupees 52 (~75 US cents) for a 500 Kcal bar. At 92 grams net weight; 12.5 grams protein; 32.86 grams lipid). It has the same nutritional content of F-100 milk formula and plumpy’Nut. On the extreme affordability front, Bangladesh is setting an example for others to follow. Bangladeshi Nobel Laureate Mohammad Younus's Grameen, in joint venture with Danone of France, is producing a special yogurt called Shakti Doi from pure full cream milk that contains protein, vitamins, iron, calcium, zinc and other micronutrients to fulfill the nutritional requirements of children of Bangladesh and contribute in improving their health. While 'Shakti Doi' (which means 'power yogurt') is primarily intended for children, it is also appropriate for adults. The price of each 80 gram cup of yogurt is only 5 takas, equivalent to Euro 0.05 (five cents). It is an affordable price even for the poor people of Bangladesh. It's locally made and significantly cheaper than Plumpy'Nut, costing about one-tenth of the cost of solutions offered outside Bangladesh. In his email to me, Col. Nair has proposed a solution for India with the target cost of one Indian rupee or less. His solution seeks to address protein energy malnutrition (PEM), iron deficiency anemia (IDA), and vitamin A deficiency (VAD) found among Indian children. Nair's idea is to develop a nutrient bar consisting of locally produced oats mixed with honey and crushed peanuts weighing about 15-20 grams, and fortified with iron (50%), vitamin A (75%), vitamin B6 and B12 (25% each), vitamin C (50%), vitamin E (50%), Iodine (50%), zinc (50%), and other nutrients like biotin, folic acid, calcium, sodium and potassium. I am not a nutritionist. However, I do think Col. Nair's proposal to develop a low-cost solution to address the massive problem of child malnutrition in India and Pakistan deserves a serious look and concrete follow-up. It's an opportunity for social entrepreneurs and the corporate sector to jump in with their creative energies and dollars to meet the challenge thrown by Col. Nair. Meeting this common challenge as joint India-Pakistan effort will ensure a better future for all south Asians, and bigger future profits from a brainy, healthy and highly productive next generation of Indians and Pakistanis. I agree with the thought of the plight of the poor in the developing country. However to some extent it is the making of these poor. Carefull analysis will reveal that the family size of the poor is larger than the middle class or rich. government give focus for educating the people for smaller family along with the subsidies otherwise, it will only allow procreation of lazy who produce and leave the child for the responsibility of the government which is already corrupt and inefficient. anon: "Carefull analysis will reveal that the family size of the poor is larger than the middle class or rich. government give focus for educating the people for smaller family along with the subsidies.."
Ignoring the problem, or blaming the poor victims, will not make the problem go away. And even if we assume momentarily that you are justified in blaming the parents, it is callous to punish the innocent children born to these parents. It is the responsibility of the state, the corporate sector, the philanthropists, and the more fortunate in society, to break the vicious cycle of poverty, illiteracy, and ill-health and make the children contributing members of society in the future. Indira Nooyi involved. Does Pepsico have a presence in Pakistan? I am impressed with Syeda Hameed's repeated acknowledgment of the problem. Let's hope it turns into concrete action soon. As to the corporations like Pepsico, they do have substantial presence in Pakistan, with lots of advertising dollars used in sponsoring sports. They will have to be shamed into acting to help the poorest of the poor who are not their target market. A study published today in the journal Pediatrics said young children who regularly ingest some imported Indian spices may be exposed to lead -- a dangerous neurotoxin. The study, conducted from 2006 to 2008, followed patients from the Pediatric Environmental Health Center at Children's Hospital in Boston who had ingested or been exposed to Indian spices and powders. One 12-month-old boy in the case study was found to have lead poisoning after regularly eating spices such as tumeric, black mustard seed and asafetida. When the family discontinued use of the spices, his blood lead levels went down within six months. But of greater concern to researchers are religious powders like cherry-colored "sindoor" -- which is applied cosmetically on the skin and which Tilak also uses routinely in her home. Some of these ritual powders comprise 47 to 64 percent lead, according to the study, and can be particularly dangerous when applied on young children. Food products had a lower percentage of lead compared with powders, but researchers were particularly concerned about children who are chronically exposed to these products -- up to several times a week -- at a young age. Well, in India's case there is no emergency (situation concerning hungry bellies) unless one is declared officially. The Hague Convention's purpose, among other things, was to make life easier for the world's citizenry in the matter of trans-national documentation. India is a signatory but discards the Convention and insists on pre-Convention attitudes. But it gets the hapless citizen to sign a waiver of insistence on the same Convention in it's favor. So an emergency concerning hungry people does not exist if the government does not say it does. And, anyway, UNICEF is just there for job opportunities. A old proverb is that god helps people who helps themself. I am not for a moment saying that the children must be punished for the mistake of the parents, however even developed countries / oil rich countries are not in a position to subsidies unlimited attention as the funds are not available with the government. Further these illiterates only vote the most corrupt politicians to power. Today mayawati the so called representative of dalit was wearing a mala of 1000 inr note. It is estimated that the mala might be worth crores. It is this uneducated masses who create the monster like mayawati. If you carefully observe that the self made millionaires of india do contribute more for the social cause than the corrupt politicians. Since the power is in the hands of the politicians who are elected by these poor ignorant people, nothing can be done for them. police officer, Director General of Police , Gujarat. as evidence at the appropriate time. Tehelka* release these in the public interest. Please do attend and give wide coverage to the conference. Malnutrition in some parts of Pakistan is as high as in Africa, says Jean-Luc Siblot, World Food Programme’s country representative for Pakistan. He was talking at a seminar organised on Tuesday to discuss the critical question of food security and analyse the government’s National Zero Hunger Action Plan (NZHAP). The $16 billion five-year plan aims to address food insecurity, hunger and malnutrition issues by reaching out to almost 61 million people across the country. The programme includes provision of nutritious and fortified food commodities to the most food insecure and vulnerable sections of society, particularly malnourished children, pregnant women and primary school children. It also features a school feed programme and establishment of “zero hunger shops” in 45 extremely food insecure districts of Pakistan. Siblot said the programme reflects a very high level of commitment towards addressing the problem of hunger and malnutrition in Pakistan. Other experts echoed his sentiment but added that the plan needs to be implemented swiftly. Dr Chaudhry Inayat of Ministry of National Food Security and Research said the plan comprises of seven components including policy reforms, establishment of a National Food Security Council, targeted social safety nets, capacity building of the ministry and partnership with international agencies. The NZHAP, drafted after rigorous consultations with various stakeholders, takes into consideration the dimensions of food insecurity in Pakistan and the steps to be taken to address the problem, Dr Inayat said. Kevin Gallagher, Country Representative United Nations Food and Agriculture Organisation, speaking at the seminar said that the Zero Hunger Plan was in compliance with the governments “right to food” obligation, which entails provision of nutritious food for everyone. “It would provide opportunities to vulnerable people who also place conditional obligation on them to secure food by their own,” he said. Silvia, a UNICEF representative, said that it was alarming to see the stagnant figures of malnutrition in the country. Rates of chronic malnutrition are as high as 50% and that a third of children born in Pakistan are underweight. That approach is called biofortification: adding crucial nutrients to food biologically, by breeding better varieties of crops that poor people already eat. Howarth Bouis is one of the people who came up with this idea, and he's been promoting it for the past two decades. He's an economist at the International Food Policy Research Institute in Washington, D.C., and director of an international effort called HarvestPlus that's creating more nutritious crops. But the idea of biofortification, he explains, grew out of earlier studies of vitamin supplements that nutritionists carried out in Asia and Africa. In some cases, they found that just giving malnourished children a vitamin A capsule every six months cut the death rate among those children by about 25 percent. "This number really astounded the nutrition community," says Bouis. "Then they started looking at iron and zinc and iodine deficiencies." They discovered that these micronutrients make a huge difference in people's health. But the idea of biofortification didn't immediately catch on. Public health experts worried it would be a waste of money; crop breeders feared low yields and rejection by the population if the crops looked different. Two decades later, the advocates have come up with varieties of some crops that have more micronutrients. The HarvestPlus effort is using traditional plant breeding. Others have created a genetically engineered "golden rice," which provides more vitamin A. Their first real success in the field, though, is the orange sweet potato. In several African countries, including Uganda and Mozambique, subsistence farmers grow a lot of sweet potatoes. They've been doing it for centuries, ever since the Portuguese brought the first sweet potatoes here from Latin America. The sweet potatoes that arrived in Africa, however, were white or yellow. Unfortunately, those sweet potatoes don't contain any beta carotene, which the body uses to make vitamin A. But the orange flesh of the North American sweet potato does. So when Bouis and others started pushing the idea of biofortification, sweet potato breeders realized that they didn't have to start from scratch. "We realized that the orange-fleshed sweet potato that is eaten in the U.S. really could provide a lot of vitamin A for the people in Africa," says Maria Isabel Andrade, from the International Potato Center, who is based in Mozambique.